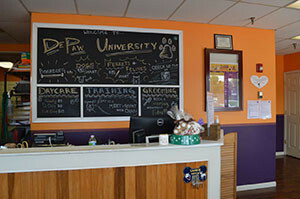 DePAW University, Canine Campus is a daycare, training, grooming, education and boarding facility located in Geneva, a western suburb of Chicago. We have a spacious 11,000 sq ft indoor/outdoor play area for our daycare guests, a variety of indoor enclosures for our overnight guests, a full-time professional groomer on staff, and trainers with 40+ years combined experience in the industry! Our daycare, kennel, and office staff are not only avid animal enthusiasts, but also certified in a variety of venues, namely Red Cross and Pack to Basics, in addition to years of real-world experience in the pet care industry. You’ll find that our staff care for and love your pets almost as much as you do! Our retention rate is outstanding and our referral rates are flattering. We greatly appreciate each client’s devotion and support. Please contact us today to discuss what we can do to make your pet-owning experience a joyful and harmonious one! 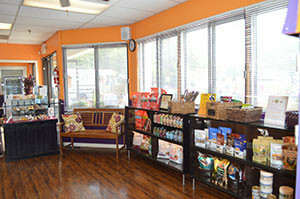 DePAW is so much more to me than a dog daycare, boarding, and training facility. 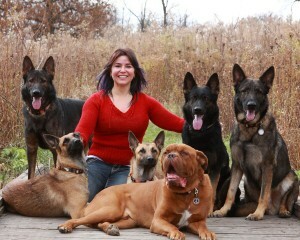 DePAW is the key to my dream of helping dogs become more integrated into everyday life. With the end of 2015, the critical stage of building a stronger foundation with great clients and services comes to a close. Now our attention is turning towards our focus on education that inspired the “University” theme all those years ago when I started. We will continue to offer the same great care we always have, and are taking steps to ensure even better customer service than we currently offer, but we are also going to be offering more ongoing educational opportunities for both pet owners and pet professionals. The more informed and equipped conscientious pet owners are, the more dog-friendly the community can become. There’s a lot of big stuff on the horizon and we will be offering some great workshops and seminars for those who wish to participate. We look forward to sharing it with you! As a thank you for all you’ve done to help us grow, we have put together this book as a celebration of the past year! We hope you enjoy it! DePAW is proud and thankful to the community for consistently voting for us in the yearly Kane County Best of the Fox awards! 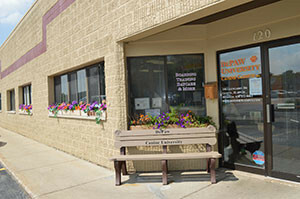 We thank YOU for the continual support and trust in choosing DePAW to care for your furry family members. We are also so very honored to receive the Daily Herald Readers Choice Top Picks!